Glasgow airport parking need not be expensive. With HolidayExtras.com®, you can book fully secure and very convenient cheap airport parking thats just a few minutes from Glasgow airport. 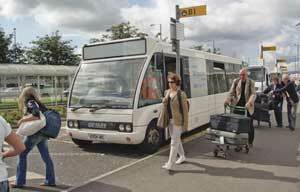 Why book cheap Glasgow airport parking with HolidayExtras.com? Sometimes you can nearly halve the cost of your Glasgow airport parking just by booking in advance with us. Booking on the day can often mean that prices are significantly higher. Our Never Beaten on Price guarantee also means that if you find the same deal cheaper elsewhere, we'll match the price. Where can I find cheap Glasgow airport parking? 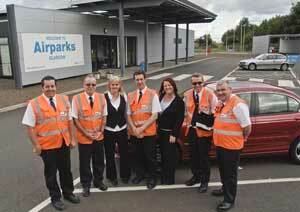 Airparks Glasgow is usually our cheapest option, because it's not within the airport grounds. However, it's only three miles away and can be reached in ten minutes on the transfer bus, which is the same amount of time as it takes to travel to the Long Stay car park. Long Stay Glasgow is an official car park within the airport grounds. Although it's still a ten-minute transfer bus ride away from the terminal, transfers are run every 15 minutes, compared with every 20 minutes at Airparks. If you're booking more than 30 days in advance, you'll have the option of booking our Long Stay Supersaver package. This is better value than an ordinary Long Stay booking because it is non-refundable and non-transferable. Both of our Glasgow airport car parks are fully secured. They are patrolled 24 hours a day and protected by CCTV, fencing, lighting and entry and exit barriers. Both also hold the Park Mark®, a national security award accredited by the Association of Chief Police Officers. Can I add any upgrades to my booking? Once you've chosen your Glasgow airport car park, why not take advantage of some of our great value upgrades. A FairFX card is all you need for your holiday currency. It works like a debit card that you top-up and use to pay for things anywhere in the world; an easy and convenient way to take care of your money abroad. The card normally costs £10, but is free when you buy it from HolidayExtras.com. Our holiday insurance is great value, especially for families and groups travelling abroad. The price is the same, no matter how many people are covered on your booking. You could even opt for our traffic assistant service. Costing just £1, this great add-on will provide you with traffic updates on the day you're travelling to the car park via text message.